In a spirited speech on the Senate floor Thursday, Senate Majority Leader Mitch McConnell (R-KY) said Democrats are trying to “bork” President Trump’s Supreme Court nominee, Brett Kavanaugh. 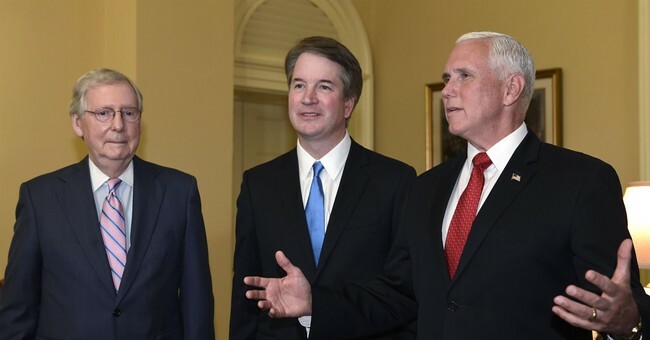 McConnell compared the Democrats’ quick targeting of Kavanaugh to their targeting and successful blocking of Judge Robert Bork, who President Reagan nominated to the Supreme Court. He said the attacks on Kavanaugh, which in the media have included attacks on his first name and his ethnicity, are an “extreme” distortion of his record. He pointed to the “outlandish” claim, debunked by a recent Washington Post fact check, that Judge Kavanaugh argued in a 2009 article that a sitting president cannot be indicted. "We have a word for blatantly misrepresenting the record and character of a judicial nominee in order to achieve a political objective. We call it an attempt to bork the nominee," McConnell said. McConnell went on to mock the media’s coverage of Kavanaugh, including a Washington Post report that the judge had gotten into some debt over buying baseball tickets. "In a breaking news bombshell report just last night, we learned that Judge Kavanaugh enjoys America's past time. Investigative reporters scoured his financial disclosures and learned that he and his friends buy tickets to baseball games and that he pays his bills," McConnell said.